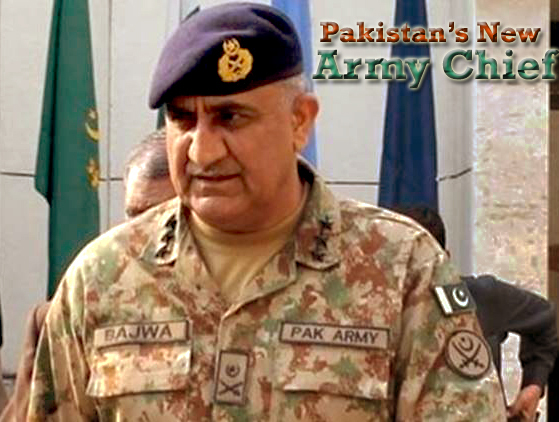 Lt General Qamar Javed Bajwa is appointed new Army Chief of Pakistan by Prime Minister Nawaz Sharif. Ninth in the seniority list, he is presently serving as Inspector General Training and Evaluation at GHQ, Rawalpindi, a position General Raheel Sharif held earlier. PM Nawaj Sharif chose him over 8 other seniors. The latest appointment of Chief of Army Staff (CoAS) once again proves that personal choice overrides merit in selection. Lt Gen Bajwa has commanded the Rawalpindi based X Corp which is considered as the biggest and the most important Corp. The entire defence installations including GHQ, Air Headquarters (AHQ) and Navel Headquarters (NHQ), PM Secretariat and Government security are also under the responsibility of 10 Corps Commander. He has also served as Chief of Force Command Northern Areas and was also Brigadier Commander while commanding a peace mission to Congo , where India’s former Army’s Chief General Bikram Singh represented India that point of time. Lt Gen Bajwa belongs to Baloch regiment and is known for his expertise in Kashmir and northern areas issues particularly related to terrorism. He is understood to believe that home grown terrorism is far more a bigger threat than any foreign threat. As a brigadier, he held a position of Chief of Staff, COS, at X Corps and also commanded formation division in Northern Areas as formation commander (FCNA). He has also commanded infantry school. Besides Lt General Bajwa, Lt Gen Zubair Hayat has been appointed the Chairman Joint Chief of Staff Committee (CJCSC). Both Generals are promoted for the rank of four- star Generals.